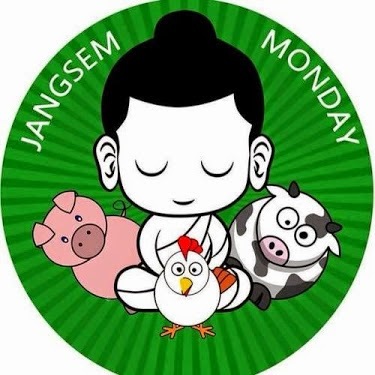 I joined Jangchub Shing (TV Show in UK) in their Cause of promoting Meatless Monday. I hope all who stumbled on my blog support this Cause. It is only once a week on Monday and you can increase the days if you wish to do so. There is also a group called "Meatless Monday" which you may choose. You can choose either and support them on Facebook. Recently my instinct is to go off meat for a month. The reasons for doing so (putting compassion aside) is the smell of these poultry and seafood. I was wondering why all these years I never smell these stench and they stink, why now? It is the smell of death. The stench of dead poultry and seafood frozen for our consumption puts me off. Many like eating fresh fishes, lobsters, crabs, octopus and because they are not human so its is OK to kill them? Others goes for exotic food like life monkey brain, life snake bile, life crocs' heads, life deers antlers and the blood and leave the deer bleeding to death. They think it is aphrodisiac, how can it be when it is so cruelly taken. A report said that there was this Chef who is getting ready snake soup for clients. He chopped off the head of a cobra but unfortuantely the snake head, I don't know how, bit him. The Chef died of poison. He killed the snake and immediately the snake killed him. I called this Karma. All animals, plants, trees, rocks, minerals, river, sea, stream, marine lives, the air and all in this World system is a blessing from Mother Earth. It is a gift but we have been taking selfishly, shamelessly and harming the environment. We contaminate everything we touch, even the air. All these are because we craved for comfort, we craved for our mouth, we craved for our feel, we craved for our eyes and we craved for our body etc. Even if we do not need it, we still want to take. We forget that there is one thing we cannot own...AGE! So Mother Earth is reacting to this. There are sickness and now ELBOLA, let alone Cancer, Aids and many funny sicknesses. The animals are reacting, from mad cow to mad chicken, to pigeon and more to come. We all have a part in these. There are groups of people trying their best to protect the Environment however their effort is not enough. You can play your part to be a little more aware of your surroundings. Learn to appreciate what Mother Earth is giving us and after all we live here. Don't take everything, only the needed. I am not asking you to be totally off meat, or off the things that you like but take only what you need. Chinese has a proverb that say "All sicknesses starts from the Mouth". We worked so hard to accumulate our Wealth but we lost it all by paying for all the medical fees, or to war or to Nature. The Law of Karma of what goes around comes around is never wrong. I invite you to join Us/ Me on this worthy Cause.